We wait for you at “Salone Internazionale Del Mobile”, which will take place in Milan from 12 to 17 April 2016. Our stand will be located in Hall 2 - Stand G37 / L30. 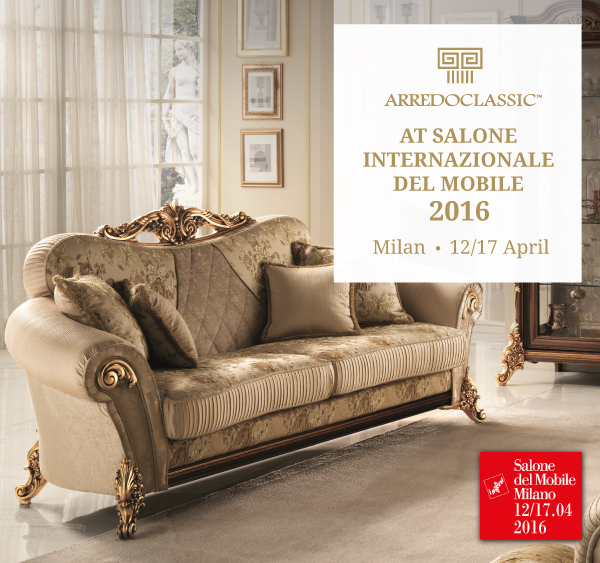 We are proud to announce that also this year Arredoclassic will be present at "Salone Internazionale del Mobile" in Milan. We expose in an entire block of 400 square meters of exhibition area, which enables us to show our rappresentative collections. The most attractive novelty will be the launch of a completely new brand named Adora. Adora embodies all the experience of Arredoclassic in producing classic Italian furniture, with a more contemporary and innovative style. Adora is created to make you feel the pleasure of living in a luxury atmosphere in your everyday life. A separate area, with a sophisticated scenografy, will be dedicated to this new brand, of which you can admire as well the dining room as the living area. Do not miss this opportunity to taste and feel the real Italian Style at one of the most important worldwide events among international furnishing exhibitions. Come to visit our stand to discover more about Adora, Luxury à Porter!